we all start from a general stage of civilized domestication (to varying degrees with regards to the various patterns affecting us), where we begin to explore various tools of defection. Tools of defection consist of various processes, attitudes and modes of existence that help liberate us from dependence on and adherence to civilized institutions, attitudes and behaviors. Defection includes (but is not limited to) capacity building toward communities of localizing, place-based interdependence. various risk factors conspire to co-opt and colonize our efforts toward liberation in order to maintain the domesticated control of the general populace. risk factors may also threaten liberating communities. defectors protect themselves and their allies through acts of defense and sabotage of various risk factors or colonizing forces. defense helps guard against the onslaught of colonization wherever and however it might occur. acts of sabotage seek to undermine and neutralize the colonizing threats at their source: the risk factors themselves. when risk factors overcome the defensive ability of the defection process, then colonization occurs, resulting in the assertion and affirmation of civilized domestication. when the defensive measures of defection effectively protect against colonization, then the defection process may continue, resulting in movement and momentum toward post-civ liberating community. post-civ communities will manifest in diverse ways based largely upon resilient adaptation to local circumstances. therefore, it is largely counter-productive to label such “hypothetical community structures.” rather, we should allow them to emerge from the efforts of the people working to create them. much of the process of creating these diverse sustainable place-based communities of localizing interdependence occurs as a result of emergence from and social evolution beyond the colonizing threat of civilization. by furthering our understanding of civilized risk factors and colonization processes we can continue to protect against the (re)emergent threat of civilization into the future. one such risk factor is “forgetting or ignoring the colonizing threat or other risk factors” in the first place. Defection provides an empowerment process that helps people — individuals, groups and communities — create time and space to identify and pursue their life’s priorities. Time and space is limited. The institutions and authoritarian hierarchies of civilization co-opt our time and space with their own dictates. In short, we often spend our precious time doing things we hate for people we don’t know and who don’t care about us <ref Alan Watts, or a readable version>. Defection is fundamentally about taking back that time and space so we can spend more time doing things we love for people we actually know and care about. Why do defectors need defense? Civilization poses a constant threat toward co-opting and mutilating our lives, lands and communities for its own purposes. It has developed and refined such colonizing processes over millenia. As a result, we have a constant need to defend ourselves from this colonizing threat. Defense focuses fundamentally on setting and maintaining healthy boundaries with abusive people, groups, institutions and, in the case of civilization, entire societies — the protection of integrity. Effective defense achieves the outcome of protecting integrity with as minimal escalation of conflict and violence (and thus energy expenditure) as possible. Ok, but why sabotage? That seems unnecessarily aggressive. After a certain level of constant colonizing aggression (which civilization has long since surpassed), both the onslaught and the resulting constant (necessary) defensive posturing and readiness in themselves become forms of colonization and may inhibit further progress. Sometimes, you just want the constant onslaught to stop, for emotional as well as strategic reasons. So we might more accurately call it “defensive sabotage.” Sabotage remains a defensive option for dealing with aggressors who refuse to acknowledge or respect the boundaries that others set. Regardless of the underlying reasons (e.g., inability or lack of caring), we want persistent and pervasive abusive behavior to stop. If the source of the abuse refuses to stop it willingly, or gives us the runaround, then the target of abuse retains the option of stopping the abuse directly, by whatever means necessary. At a certain point, we need to move past critical analysis into strategy and direct action while respecting the diverse reasons, backgrounds, intentions and priorities that people have for defecting and defending their process of liberation. A rigid command and control strategy has several problems, such as limited strategic relevance, structural reproduction of civilized authoritarianism, and likelihood to alienate and oppress more than it will empower, engage and inspire. A pattern language provides non-linear, intuitive promise and potential to help diverse peoples explore a life worth living in a world worth dying for. Each stage in this diagram consists of many ingredients or “patterns” that relate in various ways to other patterns in the same stage as well as patterns in different stages to form a complete network or constellation. Each pattern represents an archetype or collective memory of processes that work (for better or worse!). 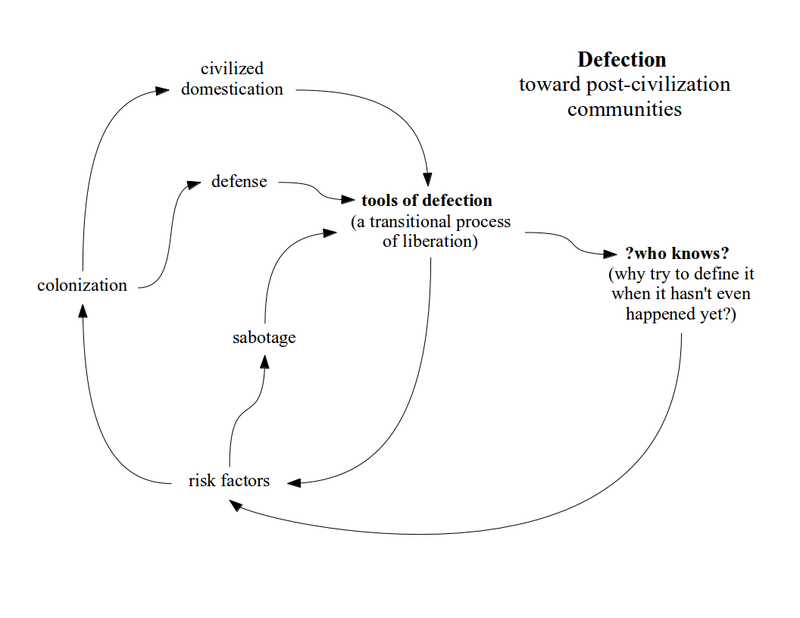 By sketching out major patterns and their relationships, we can achieve a strategic understanding of the liberation process and build a comprehensive liberation toolkit: defection, defense and sabotage. Such a toolkit may help individuals, groups and communities prioritize and focus as they pursue strategic and collaborative opportunities. Keith Farnish covers many other strategies and patterns of control in his book, Underminers, which he makes available for free via his website. In his book, he calls them “Tools of Disconnection.” They provide a fantastic basic description of the matrix of control that civilization maintains over its domesticated servants. I intent to focus more fully on Tools of Liberation. This entry was posted on Friday, October 17th, 2014 at 19:51 and is filed under Defection, Sabotage, Stopping the Destruction, Tools. You can follow any responses to this entry through the RSS 2.0 feed. You can leave a response, or trackback from your own site.